Famous failures on the field very rarely experience a phoenix-like rise off of it -- for every Heath Shuler making it to the House of Representatives, there's a Bosworth with a career that stays Stone Cold. Doing something productive without the pigskin, Todd Marinovich and his art. 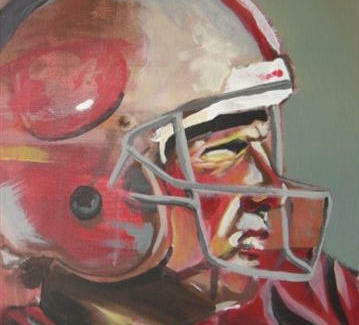 From the very same first round pick whose father famously stretched his hamstrings while he was still in the crib, Todd Marinovich has taken his Fine Arts background and applied it to contemporary acrylic-on-canvas representations, claiming he's "always been an artist first", perhaps because it fit better than professional football with his former true passion: sweet, delicious drugs. The unexpectedly artsy pieces don't shy away from athletics, from personal heros like Marcus Allen (his face shrouded in wraith-like darkness and charging at the viewer in full USC uniform) and a squinting Joe Montana (neither wraith-like nor charging), to an outstretched hand lighting upon a football, so..."The Creation of Adam" by the creation of Marv? 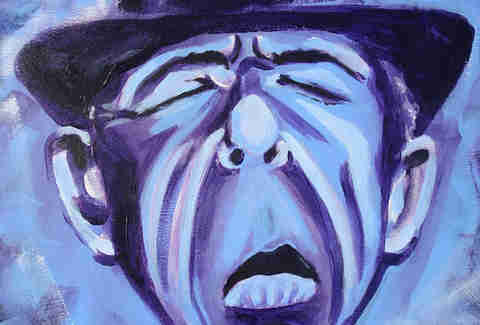 There're also portraits of esoteric musicians, from a monochromatic purple Leonard Cohen howling into a mic, to a close-up of Nick Cave's sullen face, to "Tangled up in Green": an homage to Bob Dylan who, thanks to a hat/emerald color scheme resembles the Wicked Witch, perhaps a parallel inspired by their mutual hatred of Toto. If you're into personalized steez, Todd'll work up portraits based on submitted photographs, though if you're a famous failure off the canvas, don't expect to look any better on it.